It’s one and done for Kirstie on TV Land reports Deadline. The cable channel has decided to cancel the Kirstie Alley vehicle after one season of 12 episodes. Kirstie revolves around Tony-winning diva Madison Banks (Alley) who’s enjoyed years of unbridled hedonism, drinking, and sleeping her way up and down Broadway. Her life takes a surprising turn when she meets up with Arlo Barth (Eric Petersen), the son she gave up for adoption 26 years earlier. With the help and encouragement of her long-suffering assistant and best friend Thelma Katz (Rhea Pearlman) and her eccentric chauffeur Frank Baxter (Michael Richards), Maddie realizes that Arlo is a diamond in the rough and invites him to move into her swanky New York City apartment. Despite touting a trio of veterans from legendary sitcoms — two from Cheers and one from Seinfeld — the series was neither a critical nor a ratings success. Possibly also playing into the decision to cancel was the fact that showrunner Marco Pennette had to leave at the end of the season for personal reasons and another would have had to be found to renew the series. What do you think? Did you like the Kirstie sitcom? Should it have been cancelled or renewed for a second season instead? I AM GLAD TV LAND CANCELLED KRISTIE. I DID NOT LIKE THE STUPID SHOW NOR DID I WATCH THE STUPID SHOW. 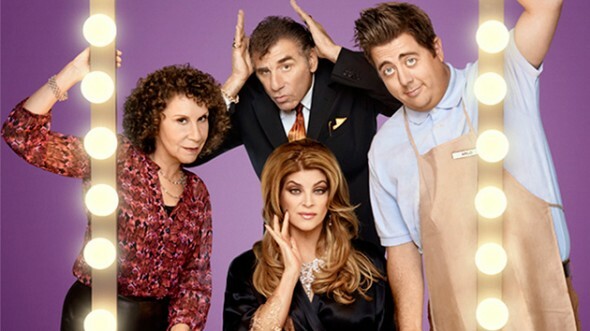 I DO NOT CARE FOR KRISTIE ALLEY, BUT HEY, LET’S BE HONEST, HER SHOW WAS LOW RATED AND I DO NOT THINK THIS STUPID SHOW SHOULD HAVE BEEN MADE IN THE FIRST PLACE! I hate that all the good shows are cancelled. … this show was funny.. fresh and of course once a good thing comes along its trashed… I’m sick of the reality stuff.. I live in a healthy dose of reality. .. it was nice to watch a show that wasn’t a mystery or competition. . Just good ole relaxing.. laughter provoking tv show. Id love to see this brought back… c’mon guys.. leave the good stuff alone.. put Kirstie back n your line up! I am disappointed that this show is being caanceled. I enjoyed it & enjoyed the cast. I hope they all get another show & leave tvland wishing they hadn’t let them go. Your loss Tvland. This was a BIG mistake! I really liked the Kirsti show and am very disappointetd they didn’t bring it back. I feel the network made a big mistake in cancelling it. I am extremely disappointed, it was quickly one of my favorite shows! I am very disappointed the Kristie Show got cancelled I thought it was such a funny and great show. Expecially since her Cheers coworker was in it with her. And the guy who played Kramer from Seinfeld was in it. I still mean the same thing I wrote above. I just spelt my name wrong. It is Bethany not Berthany. My name is Bethany. Give the show season 2 I think will great! I find it difficult to separate actor from character. In real life, Kirstie Alley is an insufferable loudmouth Scientologist. Why watch that on tv? Given the cast I believe the show deserved a slight revamp and a second season to see if could be successful. It was humorous. I love the show and don’t think they should cancel it. I think they should renew it and continue playing it. Cause it was a funny show. I am disappointed that the show was cancelled. I didn’t see that much of the show, but what I did see didn’t impress me. Plus, her character was not very likeable. And when I didn’t really hear anything else about it, I figured it was gone. How bad must the writing and directing have been for a show with Richards and Pearlman to not be a success? I don’t think the writing for the Kristy Alley show was stupid. I thought the whole show was good. And it wasn’t bad at all. I love the Kristie Alley comedy I thought it was so funny and would watch it very week it was on. Please do not cancel the show. I want them to play new season and episodes of this show. It was so haleriuos and funny I loved the show and I don’t think you should Cancel the show at all. Please continue putting new seasons and episodes of the Kristie show on Tv. I do not want to see it gone at all. It was a great and Funny show. I loved it so much. I, did not like it or find it funny. She was so self centered and arrogant. I don’t think she is self centar are arrogant. I thought the show was so funny. Huh? What did Bethany mean to write? What do you mean? what did I mean to write ? I meant to write what you saw cause a guy on here said. She is self centered and arrogant and I do not think she is self centered and arrogant. I want the show to be renewed and to be continued on the tv. I do not want the show to be cancelled. I love the show and thought it was so funny and haleriuos.